Introduction: The best way to prevent malocclusion and reduce the length of the arch in cases of early loss of primary teeth is placement of space maintainer. The aim of the present study was to compare the longevity of band and loop space maintainer with that of pontic–crown space maintainer. Materials and Methods: In this randomized control trial, 40 children aged 4 to 7 years, admitted to Isfahan School of Dentistry, were studied using convenient sampling method. They were randomly assigned into intervention and control groups. In the control group, the stainless steel crown (SSC) was fitted to the second primary molar tooth (E), and after laboratory stages, band and loop were cemented on the SSC. In the intervention group, a suitable SSC was fitted to the second primary molar tooth, and the molding was performed with alginate. After the laboratory procedure, the crown–pontic complex was cemented on the tooth. Both groups were followed-up every 6 months and the longevity of both space maintainers was examined for 18 months. Data were analyzed by Chi-square test, Kaplan–Meier survival analysis, and rank logarithm test. Results: Within 18 months, four cases of decementation were seen in the band and loop group: two cases in the first 6 months (P = 0.487), one case in the second 6 months (P = 0.474), and one case in the third 6 months (P = 0.472); no loss due to decementation was observed in the crown–pontic group. There was only one treatment failure due to loss of solder that happened in the crown–pontic group during the second 6 months (P = 1). Four failures in the band and loop group and one failure in the crown–pontic group showed no significant difference between two groups in terms of frequency of failure (P = 0.152, Kaplan–Meier survival analysis). Conclusion: Pontic–crown space maintainer is a suitable alternative for band and loop space maintainer in treating the early loss of primary molars. Early loss of primary molar teeth is a common event in children and leads to loss of dental arch length. Decreasing arch length leads to problems such as crowding, permanent tooth impaction, crossbite, and dental midline deviation., The best way to prevent malocclusion and reduce the arch length in cases of early loss of primary teeth is placement of space maintainer.,, Various types of fixed and mobile space maintainers are used in children. The space maintainer should be effective, durable, and cost-effective. The most common fixed space maintainer in children is band and loop. Although this fixed maintainer is well tolerated and durable, it does not reconstruct normal function. Some of the disadvantages of band and loop are decementation, fracture of solder or band, immerging of loop in the soft tissue, the excessive growth of the opposite teeth, lack of chewing function, accumulation of plaque, and decalcification of the abutment tooth. With regard to the last case, it is recommended that the loop to be removed once a year for closely observing of the area and applying varnish fluoride. In cases where the first primary molars are lost and the abutment teeth also have severe decays or the crown is weak, the fixed band and loop space maintainer can be used on stainless steel crown (SSC). In these cases, as an alternative method, crown–pontic space maintainer can be used. In the method, the adjacent tooth is crowned as an abutment, and a SSC is soldered to it as a pontic form. In addition to maintaining space and preventing the tilt of the adjacent tooth, crown–pontic fixed-scape maintainer prevents excessive growth of the opposite tooth and establishes the occlusion. Therefore, the aim of the present study was to compare the longevity of crown–pontic space maintainer with that of band and loop space maintainer in children aged 4 to 7 years. In this randomized control trial, 40 children aged 4 to 9 years, who were referred to an approved dental clinic of Isfahan School of Dentistry, were selected and were randomly (using the random numbers table) assigned into intervention and control groups. The Regional Ethics Committee affiliated to Isfahan University of Medical Sciences approved the study protocol (grant no. : 395971). In addition, this study has been registered in the Iranian Registry of Clinical Trial (IR.MUI.REC.1395.30751). Children who had early loss of the first primary molar along with decay or poor crown in the second primary molar and children who were at Frankel levels 3 and 4 (Frankel ++ and +) in terms of level of cooperation, children who lacked tooth root decay or furcation involvement in the root tooth, and lacked abscess in the abutment teeth in their panoramic graphs, as well as children who did not have crossbite and oral habits and the children, in which replaced permanent tooth growth survived more than 18 months, were included into study. Children who did not participate in follow-up sessions and whose parents were not willing to participate in the study were excluded. Before starting the project, a written consent form was taken from the parents of the children, and they were voluntarily included into study, whereas they were aware of the method of implementation. After clinical and radiographic evaluations to examine the conditions for inclusion into study, the samples were randomly divided into two groups. In the control group, after caries removal, the second primary molar tooth (E) was crowned and in case of pulp exposure, pulpotomy was performed and suitable SSC (3M, Maplewood, Minnesota, USA) was fitted to the second primary molar tooth, and after crimping, it was cemented using glass ionomer (GI) cement (GC, Tokyo, Japan). Then, suitable stainless steel band (3M) was fitted to the tooth E. The molding was performed using alginate (Heraeus, Hanau, Germany). After preparing plaster (STONE, Tehran, Iran) cast, stainless steel wire of 0.09 mm (0.036 in) was formed and soldered at the center of the buccal and lingual surfaces of the band. At the second session, the band and loop were cemented on the abutment tooth using GI cement (GC) [Figure 1]. In the intervention group, after removing the second primary molar tooth decay, suitable SSC (3M) was fitted to the second primary molar tooth and crimped. Pulpotomy was performed in the case of pulp exposure, and suitable SSC was fitted to the second primary molar tooth and crimped. The molding was performed with alginate (Heraeus). To determine the exact occlusion of the patient, the opposite jaw in the same quadrant was molded and the patient bite was recorded. The crown was placed in the alginate mold and plastering was performed. Regarding the occlusion on the plaster cast, the crown of first primary molar tooth was selected as pontic according to empty space, and if needed, its occlusogingival length was shortened. The complex was prepared for soldering laboratory procedures. In addition, to maintain the function of the patient’s chewing and prevent excessive growth of the opposite tooth, the second primary molar tooth crowned with the same number fitted on the abutment tooth and crimped and cemented using Tempoband band (Kerr, Orange, CA, USA). In the laboratory, two SSCs were soldered from the lingual region. To prevent the accumulation of food and plaque and easier observing the health, inside the pontic was filled with composites. Each composite layer (Denfil, Vericom, Anyang, Korea) was placed in a thickness of 2 mm for better curing, and it was cured by D-LUX dental light cure device (Diadent, Burnaby, British Columbia, Canada) for 40 s, and then, it was cast. At the next session, the temporary crown was removed from the abutment tooth and the crown–pontic complex was placed on the abutment tooth. If needed, the composite was added to inside the pontic, and if the lower gingiva was whitened, the pontic length was shortened and repolished. In addition, the possibility of passing the dental floss below the pontic should be provided to observe the health. Then, the crown–pontic was cemented using GI cement [Figure 1]. Dental floss (Oral B, Gillette, Boston, USA) was given to the patient for daily use. Both groups of control and intervention were followed up every 6 months and the longevity of both space maintainers was evaluated for 18 months. In each session, clinical and radiographic evaluations were performed to determine the status of the abutment teeth and successional tooth. In the case of fracture for reasons such as decementation or solder fracture, the sample was excluded, and a new band and loop space maintainer was placed in the area. The gingival health was defined in this study based on gingival index. This index has been used by Loe and Silness since 1963 to assess the gingival health and determine the severity of gingivitis and its position in different areas. Score 0: Healthy gingiva without inflammation. Score 1: Mild inflammation, slight changes in color and surface tissue, and lack of bleeding on probing. Score 2: Moderate inflammation, mild redness, edema, and bleeding on probing. Score 3: Severe inflammation, marked redness, edema, ulcer, and spontaneous bleeding. Calculating this index for one tooth is obtained by dividing the total sum of the scores of four areas by the number 4. In this study, two variables of solder fracture and cements dissolution were defined, so that if any of the above variables was observed in the months studied, that space maintainer was considered as failure component and excluded from the study in the following months. In the case of non-observing of each of the above variables in the months studied, that space maintainer would be considered as successful case in that month. Finally, the data were entered into SPSS-22 software (IBM Corp, Armonk, NY) and analyzed by Chi-square test, Kaplan–Meier survival analysis, and rank logarithm test. A total of 40 patients, 22 males and 18 females, participated in the study. The mean age of children participating in this research was 5 ± 0.8 in the crown–pontic group and 5 ± 0.7 in the band and loop group. Within 18 months, four cases of decementation were seen in the band and loop group: two cases in the first 6 months (P = 0.487), one case in the second 6 months (P = 0.474), and one case in the third 6 months (P = 0.472); no loss due to decementation was observed in the crown–pontic group [Table 1]. Within 18 months, there was only one treatment failure due to loss of solder that happened in the crown–pontic group during the second 6 months (P = 1) [Table 2]. 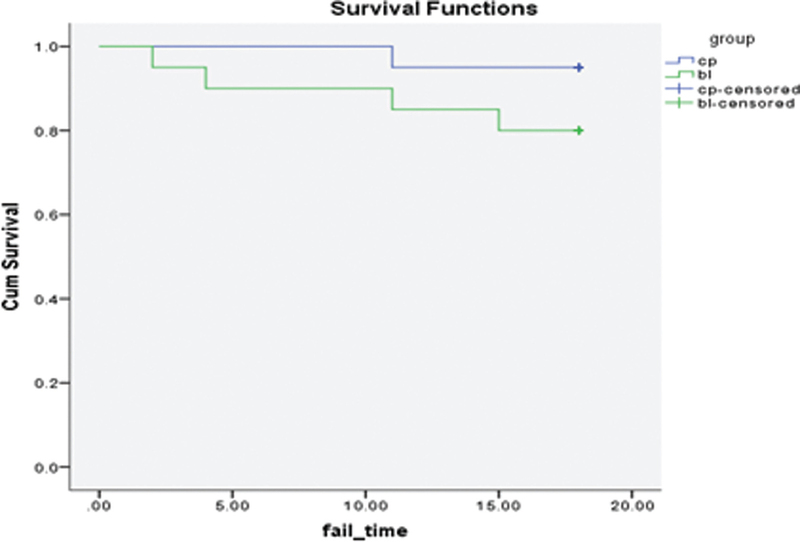 Four failures in the band and loop group and one failures in the crown–pontic group showed no significant difference between two groups in terms of frequency of failure (P = 0.152, Kaplan–Meier survival analysis) [Figure 2]. In the crown–pontic group, five cases of mild gingivitis were seen in the first 6 months, and three cases of mild gingivitis were observed in the band and loop group during that time (P value = 697). In the pontic–crown group, five cases of mild gingivitis were seen, and six cases of mild gingivitis were observed in the band and loop group during the first 6 months (P value = 559). In the 6-month period, in the crown–pontic group, six cases of mild gingivitis and one case of moderate gingivitis were observed in the crown–pontic group, and five cases of mild gingivitis were observed in the band and loop group. No significant difference was seen between the two groups in terms of gingivitis (P value = 0.660) [Table 3]. This study was a randomized clinical trial conducted to compare the longevity of two types of band and loop and crown–pontic space maintainers. In this study, 40 children who lost their first primary molar tooth were studied. The results of the study showed that four cases of decementation were seen in the band and loop group during the 18 months: two cases in the first 6 months, one case in the second 6 months, and one case in the third 6 months, but no loss due to decementation was seen in the crown–pontic group. In a study conducted by Safaripour et al. to examine the longevity of conventional and prefabricated band and loop space maintainers, the results showed that only one case of decementation was seen in the conventional band and loop group, and no cement loss was seen in the prefabricated band and loop group. The results of their study showed that there was no significant difference between the prefabricated band and loops and conventional band and loops. However, in a study conducted by Sasa et al., the longevity of band and loop was measured using GI cement. In this study, after 19 months of follow-up, the success rate of band and loop was 40%, and its failure rate was high (57.5%), and the most common cause of band and loop failure was decementation of band (82%). In the current study, one of the most common reasons for failure of conventional space maintainer was decementation, but in the crown–pontic space maintainer, no failure due to decementation was seen. Using crown–pontic space maintainer has this advantage that it reduces the likelihood of decementation because cement is less exposed to the oral environment, and thus, the problem of failure due to loss of cement is resolved. In cases where the loss of the first primary molar tooth is associated with the destruction of the adjunct second primary molar tooth, the adjacent primary molar tooth should be reconstructed by SSC. In these conditions, conventional band and loops cemented to the SSC can be used. However, it was revealed that the chemical cementing of the GI to the SSC has only 10% of the tensile strength of the cement and 13% of the strength of the GI cement with natural tooth. This evidence suggests that the GI cementing potential to the SSC is not as much as a normal tooth, and this is a reason for band and loop fracture due to the removal of the cement from the SSC. It has also been shown that cementing the band to the SSC is not successful over a long time in the oral environment. The use of crown–pontic space maintainer can be a good alternative in these conditions. Another reason for failure in conventional space maintainer treatment is the fracture in the solder and the removal of the band from the loop and its deformity is due to this. In the current study, in 18 months, one case of treatment failure was seen due to the loss of solder in the crown–pontic group during the second 6 months, and no case of treatment failure was observed in the band and loop group. In the study conducted by Safaripour et al. to compare the longevity of prefabricated and conventional space maintainers, results showed that one case of solder fracture was seen in the band and loop group during 9-month follow-up, and two cases of solder fracture were seen in the prefabricated band and loop group during that time, but results showed no significant difference between two groups. Qudeimat and Fayle also stated that the most common reason for band and loop fracture is the fracture of cement and solder. Precise designing and performing of solder laboratory procedures can prevent such fractures. In a study conducted by Subramaniam, glass-fiber-reinforced composite resin (GFRCR) composite was compared as a fixed space maintainer with band and loop. After 12 months of follow-up, the overall success rate and longevity of GFRCR (53%) was higher than those of band and loop (33.3%), but the difference was not significant. Moreover, in a study conducted by Yilmaz et al., children who needed space maintainer and their abutment teeth were decayed or had inadequate occlusogingival length, SSC was placed on molar teeth as abutment. Then, buccal surface of crown was removed to create an open face SSC, and rectangular-shaped wire, as space maintainer, was cemented to the buccal surface, and no fracture was observed during 12 months of follow-up. Unlike these designs, the use of crown–pontic space maintainer takes less chair side time from dentist, and it reconstructs the occlusion of the patient and improves the nutritional status of the child. In the current study, in the crown–pontic group, five cases of mild gingivitis in the first 6 months, five cases of mild gingivitis in the second 6 months, and six case of mild gingivitis and one case of moderate gingivitis in the third 6 months were seen. In the band and loop group, three cases of mild gingivitis in the first 6 months, six cases of mild gingivitis in the second 6 months, and five cases of mild gingivitis in the third 6 months were seen. No significant difference was found between the two groups. In both groups, the cause of gingivitis was a lack of observing the health properly. In the study conducted by Safaripour et al., the gingival condition of patients was compared using the gingival index in two conventional and prefabricated band and loop groups, and no gingivitis was reported in any of the groups. To overcome this problem, it is recommended for parents to monitor their child health. 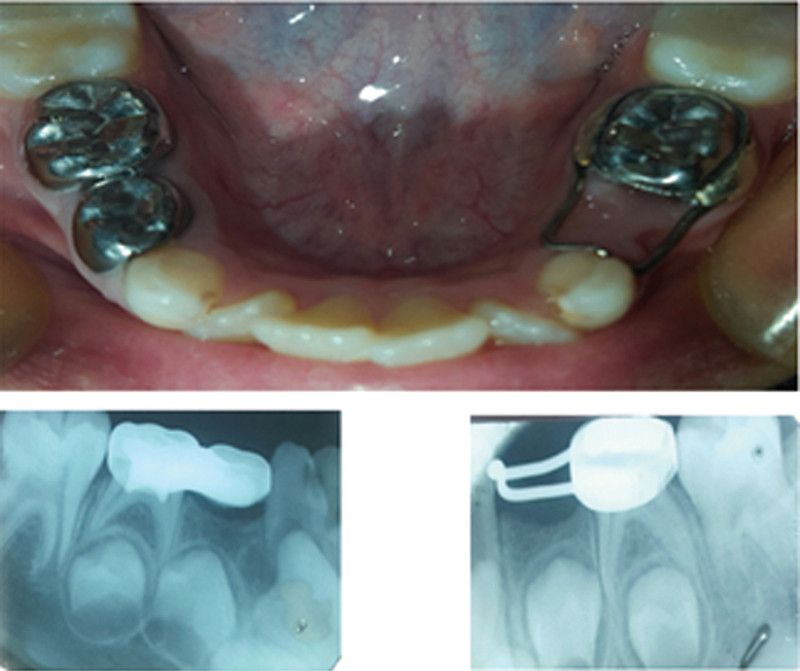 One of the disadvantages of band and loop space maintainer is lack of reconstruction of the patient’s occlusion and non-prevention of excessive growth of the tooth., Using crown–pontic space maintainer can provide better and more effective service to the patient, and in addition to maintaining space, it improves the child function. One of the limitations of this study is lack of comparing the ability to observe health and nutritional status using two different types of space maintainer. As use of crown–pontic space maintainer, in contrast to band and loop space maintainer, makes it possible to reconstruct the patient’s occlusion and bite, it can be suggested that in addition to comparing the longevity of conventional and prefabricated band and loop and crown–pontic space maintainers, the children’s satisfaction with convenience of observing the health in these methods to be compared in future studies. Crown–pontic space maintainer is a suitable alternative to band and loop space maintainer method in treatment of early loss of molars. It also reconstructs the patients’ occlusion. Yeluri R, Munshi AK. Fiber reinforced composite loop space maintainer: An alternative to the conventional band and loop. Contemp Clin Dent 2012;3(Suppl 1):S26-8. Sasa I, Hasan A, Qudeimat M. Longevity of band and loop space maintainers using glass ionomer cement: A prospective study. Eur Arch Paediatr Dent 2009;10:6-10. Cantekin K, Delikan E, Cetin S. In vitro bond strength and fatigue stress test evaluation of different adhesive cements used for fixed space maintainer cementation. Eur J Dent 2014;8:314-7. Sharma U, Garg AK, Gauba K. An interim, fixed prosthesis using natural tooth crown as a pontic. Contemp Clin Dent 2010;1:130-2. Kermanshah H, Motevasselian F. Immediate tooth replacement using fiber-reinforced composite and natural tooth pontic. Oper Dent 2010;35:238-45. Unlu N, Belli S. Three-year clinical evaluation of fiber-reinforced composite fixed partial dentures using prefabricated pontics. J Adhes Dent 2006;8:68-71. Northway WM. The not-so-harmless maxillary primary first molar extraction. J Am Dent Assoc 2000;131:1711-20. Bahreman A. Early-age orthodontic treatment. Quintessence 2013;1:83-6. Loe H, Silness J. Periodontal disease in pregnancy: Prevalence and severity. Acta Odontol Scand 1963;21:533-51. Safaripour M, , Eshghi A, Tahririan D. Comparison of longevity of prefabricated band and loop and conventional band and loop in children’s primary teeth. Safaripour M, Isfahan University of Medical Sciences: Eshghi A, Tahririan D, 2017. pp 20-9. Qudeimat MA, Fayle SA. The longevity of space maintainers: A retrospective study. Pediat Dent 1998;20:267-72. Subramaniam P, Babu G, Sunny R. Glass fiber-reinforced composite resin as a space maintainer: A clinical study. J Indian Soc Pedod Prev Dent 2008; 26(Suppl 3):S98-103. Yilmaz Y, Kocogullari M, Belduz N. Fixed space maintainers combined with open-face stainless steel crowns. J Contemp Dent Pract 2006;7:95-103.